When mailing a thick letter, I would always wonder whether I had put enough postage on the envelope, and my paranoia probably made me put three stamps on (when only one or two were necessary) far too often. Here in the United States, we pay one amount for up to one ounce of weight, then add another increment for each additional ounce, or fraction thereof. First of all, a rule-of-thumb: generally, use one stamp for every 5 sheets of paper. Most paper that comes from a copier or printer here nowadays is 20-pound paper. That means that one ream of 500 standard-size sheets weighs 20 pounds. These standard sheets are 17" x 22", and since office paper is 1/4 that size, doing the math yields about 6 sheets to the ounce. 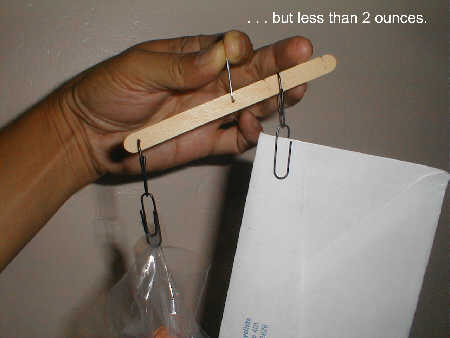 When the weight of the envelope is taken into account, we arrive at the rule-of-thumb. Now, on to making a scale. Start with an ordinary Popsicle stick. This doesn't have to cost anything, just hang around outside a 7-11 store for a few minutes in the summer, and someone will throw one away. Drill a small hole as close to the center of the stick as you can. You may wish to use a ruler to measure. Drill another hole near one end of the stick. The positioning of these holes does not have to be absolutely precise; the scale will be calibrated, later. You could also use the awl from a pocketknife to make the holes, if you don't have a drill handy. The holes should be big enough to hook a paperclip through. Now thread one paperclip through each hole. Add more paperclips as shown below. 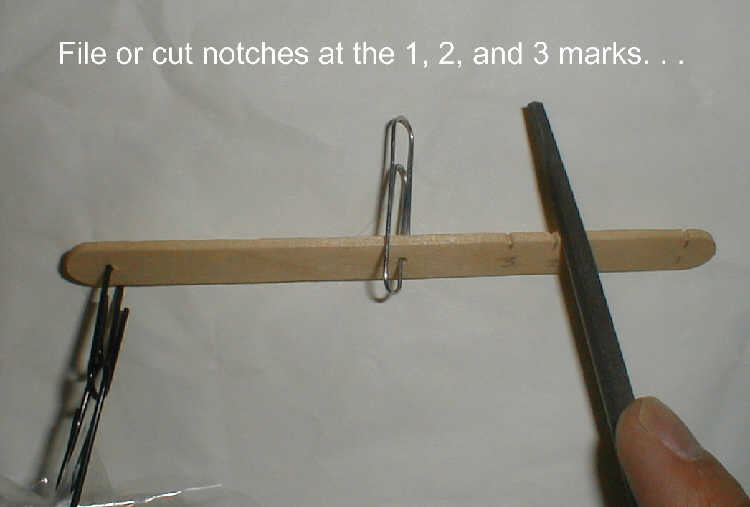 Notice that the paperclips on the right are slipped over the stick, not threaded through a hole. 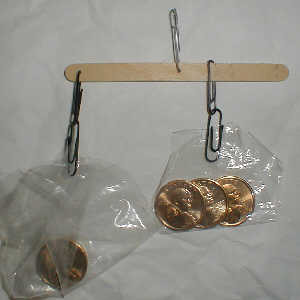 Finally, cut some pieces out of a plastic bag to use as holders for the weights. The scale is now ready for calibration. You will need two equal weights for calibration. I used two golden Sacajawea dollars, but quarters or equal amounts of pennies would work, too. The sizes of the weights are not important, only that they are equal. Carefully slide the weight on the right back and forth until the scale balances. Mark this point with a pencil. You may wish to label it "1", because this is also the 1:1 balance point. 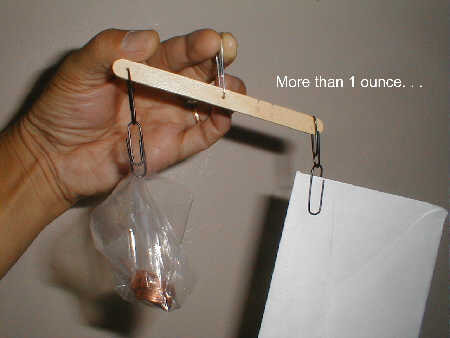 In case you were wondering, the weight of the paper clips and plastic bag is negligible compared to a penny. Besides, this scale only needs to give a rough idea. Now, switch to two golden dollars on the right, and find the balance point, marking it with a "2". Do the same with three dollars, and mark that place with a "3". After marking the numbers, file a little notch for each of the markings "1", "2", and "3". 11 cents is a lot cheaper than $3.02, but you can get a weight for free by weighing out one ounce of pebbles or sand at the post office. With the 1-ounce weight attached to the left side of the scale, we are ready to weigh a letter. 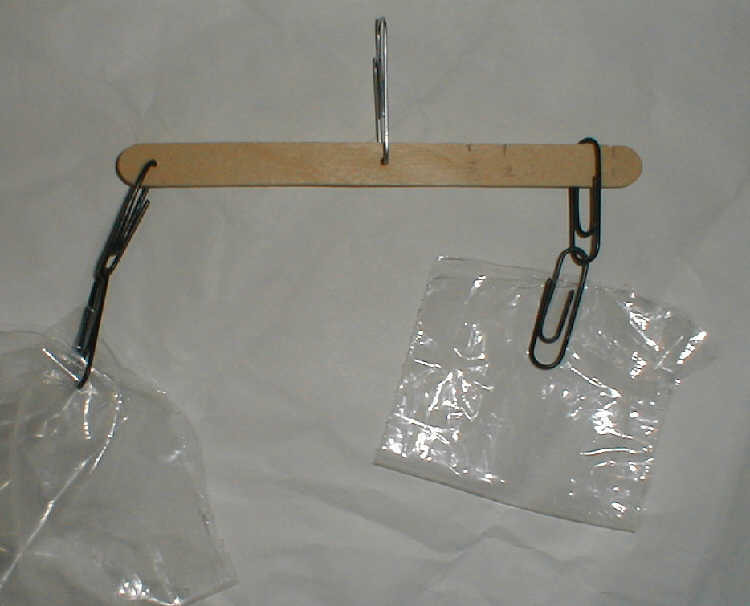 Simply clip the letter onto the right side of the scale (the plastic bag is no longer needed). Try the letter on the 1-ounce notch, first. If the letter goes up, it weighs less than one ounce, and one stamp will suffice. If the letter goes down (as shown above) it weighs more than one ounce. In that case, try the 2-ounce notch. If the letter now goes up, the weight is between 1 and 2 ounces, and requires the 2-ounce rate. This operation can be repeated to find out whether the postage for 3 ounces will suffice. 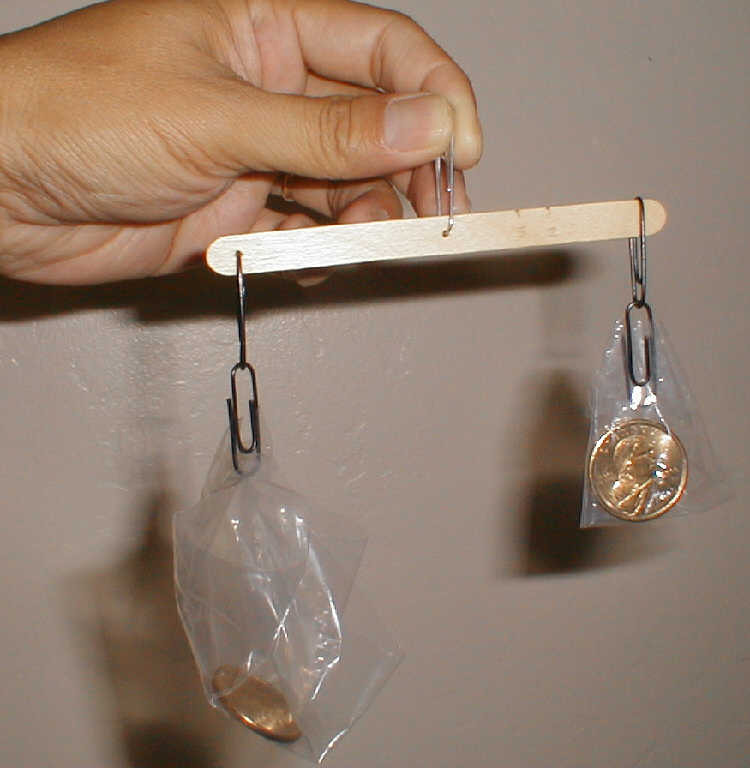 This scale can be made of even cheaper materials. 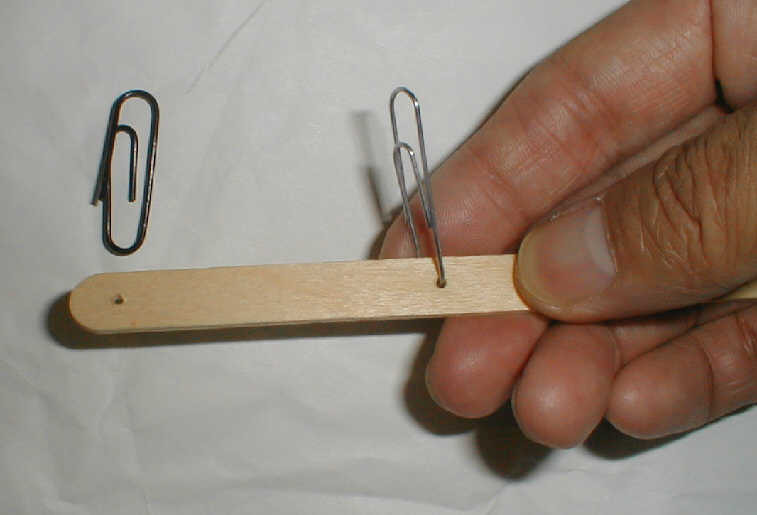 Instead of the Popsicle stick, an ordinary twig could be used. 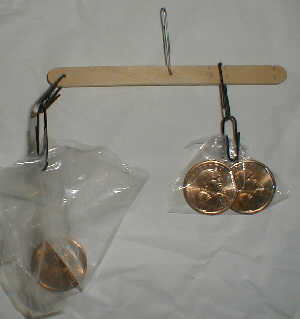 And instead of the paper clips and plastic bags, string or hair can be used to secure the middle and ends of the scale. And, as before, a rock of suitable size can be used for the standard weight.